You guys, I miss sleeping in. It’s pretty much an impossibility with a 14 month old who loves waking up early (thank goodness he likes getting up closer to 6:15 lately compared to 4:00-5:00am as a younger baby!) I know one day it’ll happen again. Love that kid. One thing that makes the weekend early mornings a little sweeter are brunch outings. 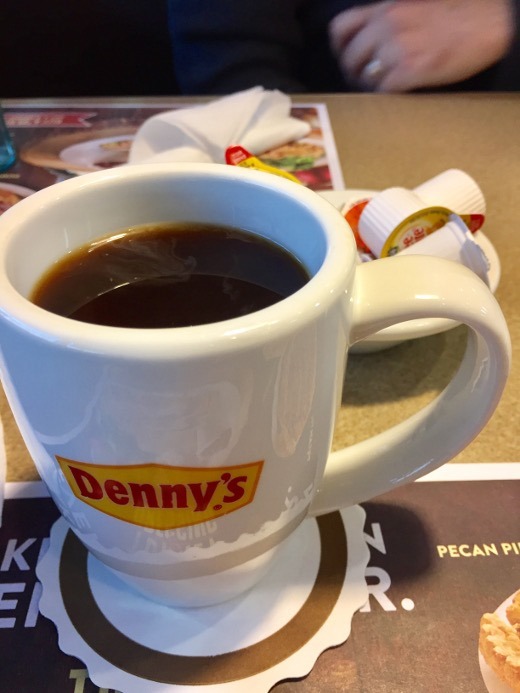 When was the last time you were at Denny’s? I think I was an undergrad at U-M! It’s been a while. 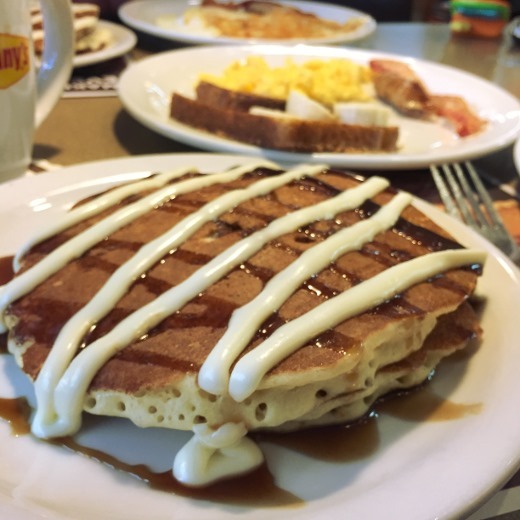 The folks from Denny’s invited us in to check out their new seasonal menu featuring Salted Caramel & Banana Cream Pancake Breakfast, Pumpkin Cream Pancake Breakfast, Sticky Bun Pancake Breakfast, and a Rudolph Pancake Breakfast, all on the – you guessed it – breakfast menu. I was surprised to be asked if I’d like light roast or dark roast coffee when ordering! I’m actually usually a medium to medium-dark roast kinda gal, but I went with the dark roast coffee. Neat that they have options. 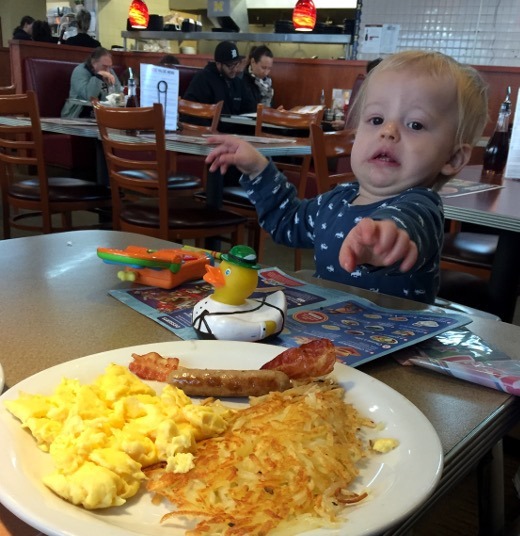 This cutie pie joined mama and dada for his first breakfast at Denny’s. He was a hungry boy!! This exactly how I feel when I see the server bringing food to my table too. The huz and I both tried the Sticky Bun Pancake Breakfast with thick, fluffy buttermilk pancakes. If you like sweet breakfasts you’ll love these cinnamon-y pancakes. I definitely needed some savory bites to balance out the sweet pancakes. 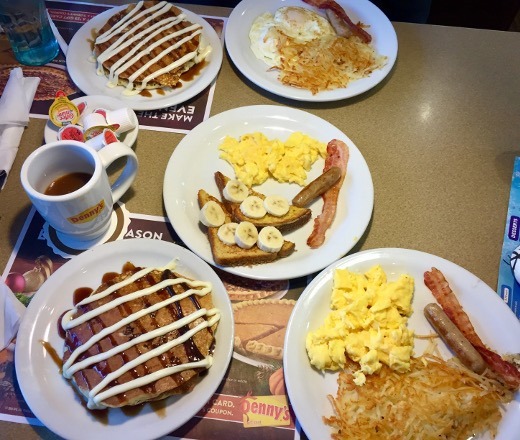 The pancake meal comes with eggs, pancakes, and two pieces of meat. The huz and I both commented on how much we enjoyed the hash browns. 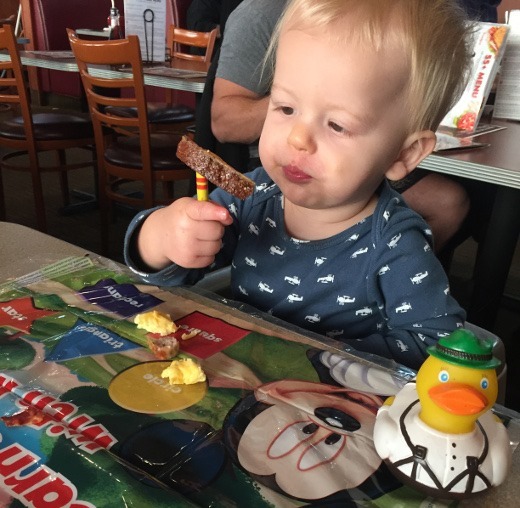 We totes forgot to bring J’s toddler fork and spoon from and he’s going through this phase where he only wants to eat food if it’s on a fork – so he used his crayon as a fork instead. Clearly we are parents of the year. 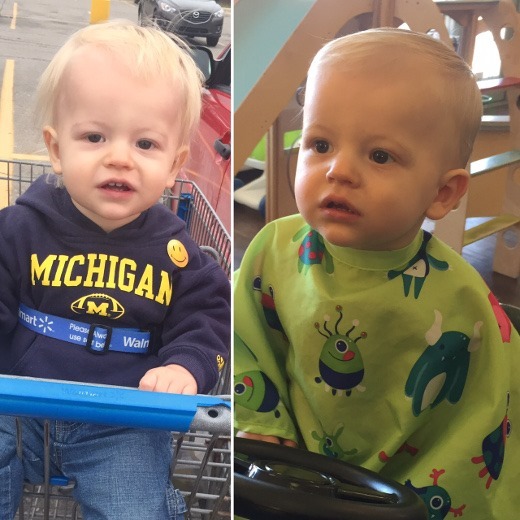 After lunch we took J to get his first haircut! 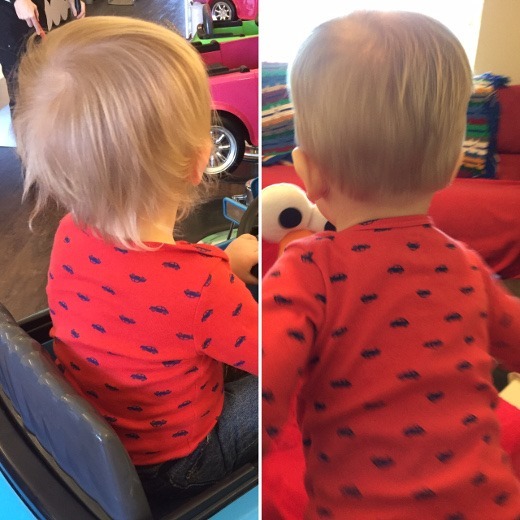 We just wanted to neaten up the mullet action happening in the back. I miss his sweet, wild baby hair (it’s SO soft! ), but I think it looks a lot neater now. We got to keep a lock of his fine blonde hair though, and he got a certificate for his first haircut. He did great! 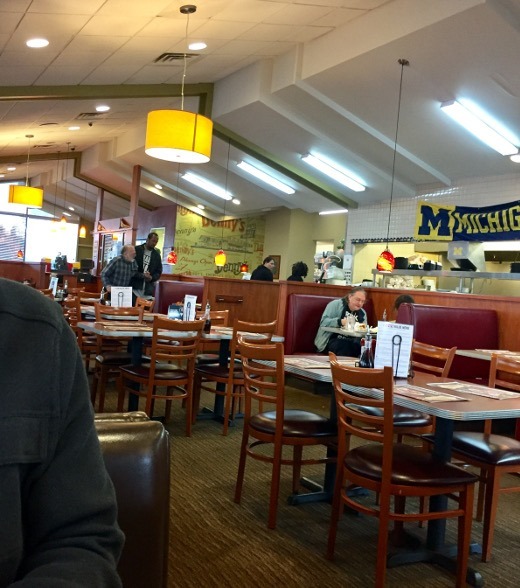 We had a really positive experience at zoey + joey in Ann Arbor. Before and After of the front. Is he not the cutest child you’ve ever seen? He gets at least 100 smooches daily. 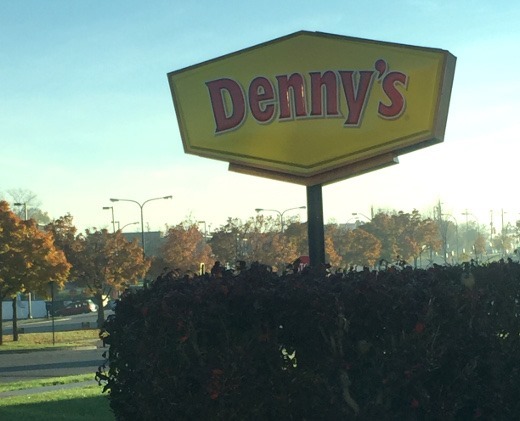 What do you like to order at Denny’s? 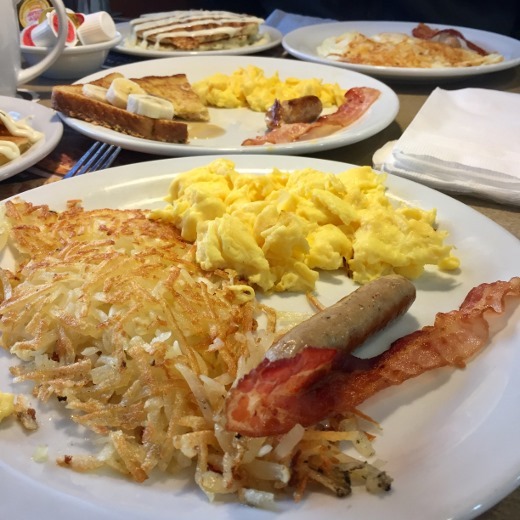 Note: Denny’s provided a gift card to us to try their seasonal offerings but all opinions are my own!